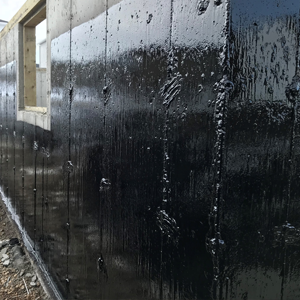 Northern Tar & Contracting Ltd has been serving both residential and commercial clients in the Regina and surrounding area since 1980. Whether you are looking for waterproofing, damp proofing or foundation coatings, we are your contractor of choice. “We do it right” every time. 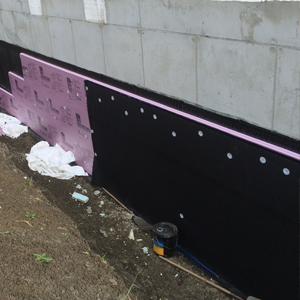 Foundation coating on the exterior of a foundation wall prevents water and water vapor from moving through the wall. Depending on its intended purpose, the coating can be a durable, weather-resistant film or durable black tar. Waterproofing entails creating a membrane, or coating, which helps prevent water intrusion of a basement wall surface. With hydrostatic pressure, even a small crack can allow water into the basement. 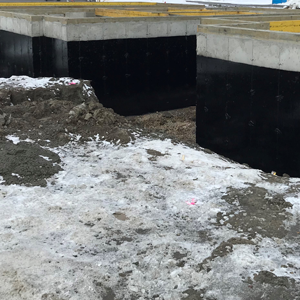 Northern Tar & Contracting Ltd utilizes peel and stick or torch on membrane, dimple foundation wrap and/or super pro coatings spray on membrane on the outer basement wall, preventing water intrusion and keeping the basement dry. Damp proofing is intended to keep out moisture, such as soil moisture, from infiltrating basement walls. Damp proofing is a coating, usually asphalt-based, that is either sprayed on or hand applied to the outside of the wall.